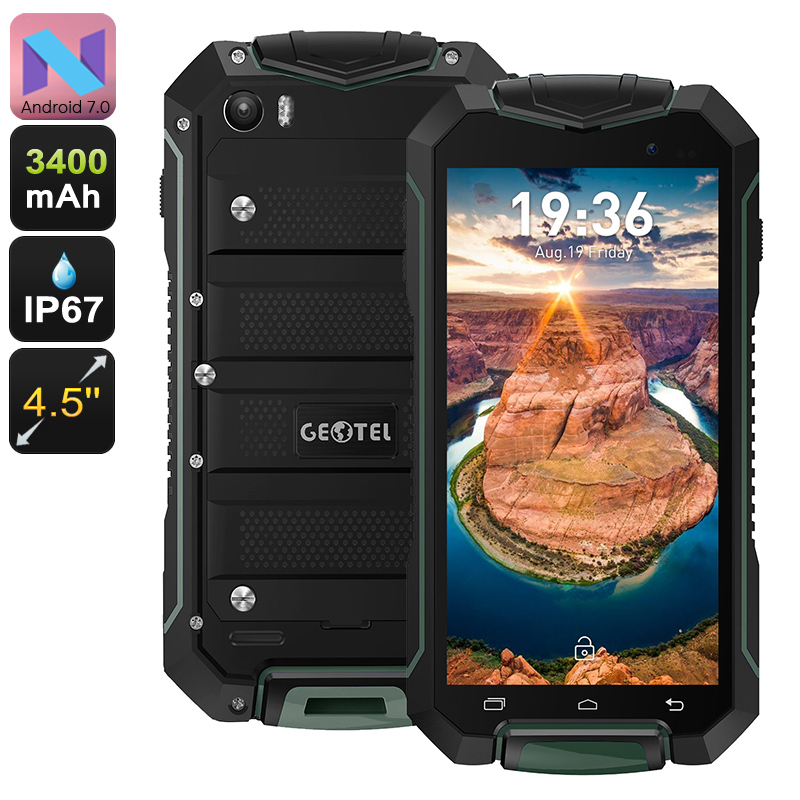 Successfully Added Geotel A1 Rugged Smartphone - Android 7.0, Quad-Core CPU, 8MP Camera, Dual-IMEI, IP67, 4.5-Inch Display, 3400mAh (Green) to your Shopping Cart. For the smartphone users out there that like to head out into the wild yet, at the same time, like to stay connected and enjoy the latest mobile features available to the market – we introduce the Geotel A1 rugged smartphone. This Android smartphone does not only feature an extremely durable IP67 waterproof design, it also comes packed with the most up to date hardware and software alike. Running on the latest Android 7.0 operating system, the Geotel A1 rugged phone introduces you to the latest software and features the mobile industry has to offer – bringing along an exceptionally smooth and powerful user experience that allows you to enjoy your smartphone like never before. Whether you’re into mobile gaming, movies, browsing the web, or simply like to use the newest mobile applications – this Android 7.0 smartphone is guaranteed to meet your demands. As a rugged smartphone, the Geotel A1 puts a high importance on bringing top-level connectivity. By featuring Dual-SIM card slots and two IMEI numbers, this waterproof smartphone allows you to be connected to two network providers simultaneously. From now on you’ll be able to be reachable on two phone numbers while using merely one device – bringing along countless of options to separate your work life and private life or to increase your data connection by using a local SIM card besides your own domestic SIM while traveling abroad. Increasing the overall user experience of the outdoor lovers even further, this rugged smartphone features besides its amazing global connectivity also a stunning 8MP camera that allows you to shoot mesmerizing pictures while embarked on your next adventure. From now on not a single special moment will pass by uncaptured as wish this camera in your pocket you’ll always be able to snap beautiful images and stunning footage at any given moment. With its beautiful 4.5-Inch display, this Android smartphone provides you with a sophisticated platform at which to enjoy all your favorite media, games, and smartphone features while out in the wild. Along with its 3400mAh battery, it provides you with a stunning 6 hours of continuous usage time and an absolutely mind blowing 120 hours of stand-by time – making the Geotel A1 rugged phone the perfect companion to bring along on your next outdoor adventure. From now on you’ll be able to head out into the wild with confidence as with this rugged Android phone in your pocket you’ll always stay connected and be able to enjoy your favorite media for countless hours no matter where on the globe you’re at. Packing a powerful Quad-Core CPU that has been clocked at 1.3GHz; this rugged Android phone holds enough strength to handle the latest applications, games, movies, and more. Along with its processor, the Geotel A1 furthermore features the ARM Mali-400 graphic’s unit that supports stunning visuals and high detail – allowing you to enjoy your mobile media experience even further. Simply head out to the play store and download the latest apps, games, movies, and more. With the possibility to add an external 64GB of memory, you can be assured that this Android 7.0 smartphone always holds enough space to store all your media and files alike – assuring that you’ll never have to be bored again. Great phone, does everthing as expected. NO bloatware, so 5 stars here! Very clean Android Nougat (7.0) install. Good battery live, nice screen, good colors and sound. Very good phone for very good price!